I’ve been selling PS1 modchips on eBay for a while now. This post aims to be the ultimate source of information on PS1 modchips, including how to install them into every version of the PlayStation 1. I may have sent you here if you were looking for installation diagrams, or had questions a bout how to install the modchip. Continue reading and I’ll answer those questions and more. As of right now this guide is still a work in progress. This page is the starting point of the guide. It includes some frequently asked questions about PlayStation 1 modchips in general, and then links off to more information about each type of chip, and those pages link off to installation guides for each console model. I’m not a PlayStation 1 modchip expert. This guide has been put together from a combination of my experience, and what I have found online. Many of the sources for PlayStation 1 modding information have gone offline, or are spread out across many forum threads. My goal is to have a single guide that covers as much information as possible, making it easier for everyone to get solid information about PlayStation 1 modchips. If you have any suggestions, corrections, or additional information, please leave a comment and I’ll be happy to update this guide. Here’s a list of modchip specific guides, which include links to installation diagrams for each board, and source code to make your own chips. Modchips that aren’t in the list above are covered in less detail in a guide covering other older modchips. What is a modchip, and what is it used for? The idea of a modchip is pretty straightforward. It is typically a small chip or board that is soldered to various parts of a video game console. The chip is programmed with special software that is used to circumvent DRM protection on the console. In the case of the PlayStation 1 a modchip allows the console to do many new things. Here’s a list of MM3 and Mayumi v4 modchip features. Play video game backups from any region. Play genuine games from any region. Works with all games, even the ones with anti modchip code. A common use of a modchip is to play games from other regions, like Japan, that weren’t released in the United States. With a modchip there is no need to import a console from each region. The original PlayStation was one of the first consoles to have a modchip available for it. This was primarily due to the rise of cheap CD burners and blank discs that allowed game backups to be easily produced. That and the rising popularity of downloadable game backups online. PlayStation 1 modchips were produced as early as 1996, not very long after the console was first released. These early mod chips were very expensive, but over time they were reverse engineered, cloned, and sold prices fell as a result. The original chips used the PIC16C54 microcontroller. In 1997 a new modchip was released called “Old Crow”. This new modchip was another clone of the original modchip, but the source code was released to the public, reducing the cost of the chip even further. “Old Crow” was originally made for the Zilog Z8 microcontroller, but versions were released for the PIC16C54, and PIC16C84 as well. Later in 1997 the “Old Crow” code was ported to the then new PIC12C508 microcontroller, which is still being used for modchips today. The new chip dropped the modchip prices to the price range they are still sold at today. Currently there are a few options for the PS1 modchip. The three most popular chips today are the MM3, the Mayumi v4, and the ONEchip. All three are based off of the PIC12C508, but there are ports that allow the code to run on other chips like the PIC12F629. These chips are based on the “Old Crow” code with additional features like support for anti modchip games. MM3 and Mayumi v4 chips are very similar, but operate slightly differently. Because of this some consoles may work better with one than the other. ONEchip modchips are designed specifically for PAL region PSone’s, and don’t work with anything else. They were designed to bypass additional protection inside the SCPH-102. There is also newer code designed to be used with modern Atmel processors like the ATmega and ATtiny series of chips. How does a PlayStation 1 modchip work? PlayStation 1 modchips were designed specifically to bypass the copy protection and region coding that was built into game discs to prevent piracy. In particular there is a stream of data sent from CD drive to the processor every time a game starts. The steam is sent in serial at 250bps and includes the text SCEI for Asian discs (NTSC/J), SCEE for European discs (PAL), or SCEA for North American (NTSC/US) discs. The console’s processor is programmed to look for this stream and only accept discs from its region. To bypass this copy protection mechanism the modchip removes the signal from the disc, and replaces it with the correct region coding. So for an American console the modchip will send the processor the SCEA string regardless of the disc that is inserted into the system is coded to send. Anti modchip games have additional data in this stream to throw off some modchips. Newer chips like the MM3 check for this additional data and let it through to the processor if it exists, along with the spoofed region coding string. PAL PSones have additional protection built into the BIOS. ONEchip and PsNee modchips connect to a couple BIOS pins and patch it to allow booting out of region games. Without the BIOS patch PAL PSones can only play PAL region games. Japanese systems starting with some SCPH-3000 models also have a similar region lock, but it hasn’t been bypassed by any modchips yet. If you want to learn more about how a PS1 modchip works, I recommend taking a look at the PsNee project on Github. The project is the modchip code for Atmel processors. The code is well documented and explains how everything works. What are the limitations of a modchip? There are several problems you may run into with a PlayStation 1 with a modchip installed. 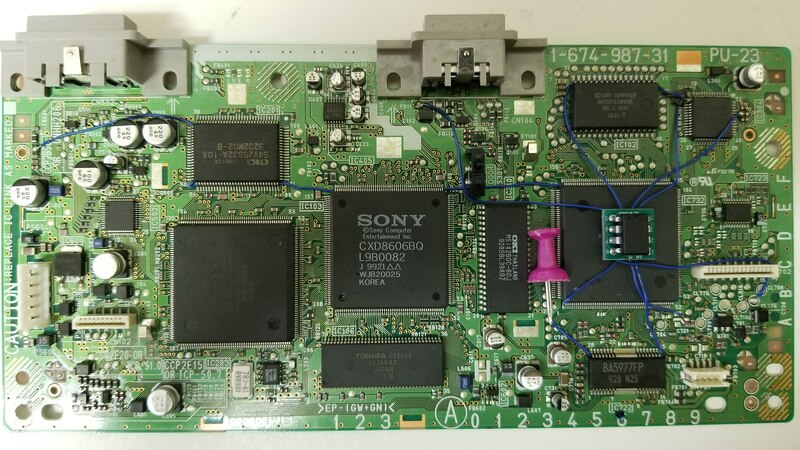 If you own a Japanese PS1, version SCPH-3000 or later (some SCPH-3000’s are immune), and install a modchip into it, you may run into a problem when you try to load an American or PAL game. This is because starting with some SCPH-3000 PS1’s Sony added an additional region lock to the BIOS of the system. The first way is to replace the BIOS chip inside the Japanese PS1 with an American BIOS chip. Ideally you’d find one from the same model, for example if you have a SCPH-7500 you’d replace it with a SCPH-7501 BIOS chip. BIOS chips from other American models should work as well, but if you can get the same model there is less risk involved. This method requires a hot air rework station. The second way is to replace the whole board inside your Japanese system with an American board. For example if you have a SCPH-7500 you’d put a motherboard out of a SCPH-7501 inside. This method would make your console appear to be Japanese from the outside, but it would really just be an American system. The third way is to patch your game backups to appear like Japanese region games. This method is kind of a pain, especially if you already have a bunch of backups, but it doesn’t require any additional hardware. You can use a tool like this one. At the moment there is no modchip that bypasses this region lock, but it is theoretically possible. In North America we have NTSC-U/C consoles and TV’s, and in Japan there are NTSC-J consoles and TV’s. Meanwhile Europe and some other parts of the world there are PAL consoles and TV’s. In the case of the PlayStation 1 the modchip can be used to unlock the console’s ability to output video for any region based on the game being played. The problem with this is that not all TV’s accept all input signals. For example if you put a PAL game into your modded system and try to play it on an American TV you might not get any video on your TV. To get around this problem I recommend buying a cheap composite to HDMI converter. Typically these will take the weird analog signal that may be associated with a game from another region, and convert it into a nice and standard HDMI signal that your TV will display without any problems. PAL PSones have additional region locking built into the BIOS. This prevents non-PAL games from loading, even if a modchip is installed. The good news is that there are several modchips that can patch the BIOS in order to bypass this protection. Both PsNee and ONEchip modchips have support for PAL PSone BIOS patching. What modchip should I choose for my PlayStation 1? This is a question there is no perfect answer for. Each chip has its own pros and cons, and at this point in time there is no perfect chip that works 100% of the time with every PlayStation 1. I plan to do an experiment at some point in the future where I look more into the boot success rate of popular chips. If you have a PAL SCPH-102 PSone then you need to either use a ONEchip, or an ATmega based PsNee (make sure whoever is selling it has enabled PAL PSone BIOS patching in the firmware as well). You really can’t go wrong with either chip, just go with whatever is the easiest or cheapest to find. If you have an older system, like a PU-7 or PU-8 SCPH-100x console, then you have a few options. One choice is the MM3 modchip, but from my experience they don’t support full stealth mode with PU-7 boards, and aren’t always the most reliable with every PU-8 board either. Stealth 2.8a chips are also available and work with PU-7 and PU-8 boards. What I would recommend is using a PsNee (either ATtiny or ATmega). I have confirmed that stealth mode works with the PU-7, and haven’t ran into any reliability issues when booting games. If you have any other version of the PS1 then you can use the MM3, Mayumi v4, or PsNee. In general MM3 modchips are very popular and should at least partially function with every version of the PS1. Make sure you install at least seven wires if you want to be able to play anti modchip games. Mayumi v4 modchips are also popular and should at least partially function with every version of the PS1 (except SCPH-100x). These chips require eight wires to be installed. They can be more reliable than MM3 chips in many cases because they are triggered using the PS1’s internal clock and not the clock inside the PIC chip itself. How can I make my own PlayStation 1 modchip? If you only need a few modchips you are probably better off buying your chips from me or another seller. However if you need a lot of modchips you might be able to save some money by buying the tools needed to make your own modchips. There are three paths you can follow. This is the traditional approach. The PIC12C508A is an older chip that’s harder (and more expensive) to find a programmer for, and will reach end of production in the near future. This is an alternative approach. The PIC12F629 is a newer chip that’s easier (and cheaper) to find a programmer for, and will continue to be produced for a longer than the PIC12C508A. This is a more modern approach. I personally haven’t tried doing this, but I can see it being the easiest option in the future. Arduinos are very popular, and they can be used as a modchip. Standard Arduinos like the Arduino Pro Mini, and Arduino Uno can be used out of the box and programmed using any computer. Chips like the ATtiny45 are cheaper and can be used as well, but an external programmer is needed. Can you check and see if I installed this correctly? Tried my first backed up game today and nothing. But it plays regular games fine. So I’m not sure if I’m not doing something right burning them or if I messed something up soldering in the chip. Thank you. You can remove wires 2, and 4, since they aren’t needed.